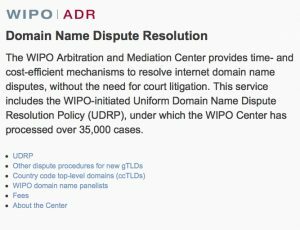 What is The Uniform Domain Name Dispute Resolution Policy (UDRP)? UDRP is a legal tool used for cancelling or transferring domain names that unlawfully use brand names or corporate trademarks. UDRP allows for the cancellation or transfer of an infringing domain name (URL). UDRP is often the most feasible tool when the domain name is registered by someone outside of the country. Through The Uniform Domain Name Dispute Resolution Policy (UDRP) the owner of a trademark or service mark can dispute the registration of a domain name if the domain name is similar or identical to the owner’s mark. Compared to a federal civil lawsuit, a UDRP proceeding is a faster and more affordable way to resolve a dispute regarding an Internet domain name. In addition, the procedures are considerably more informal than litigation, and the decision-makers are experts in such areas as international trademark law, domain name issues, electronic commerce, the Internet and dispute resolution. What is required to start a UDRP proceeding? After a complaint is filed, the complaint is served upon the Respondent (the holder of the domain name). The Respondent is then allowed to file a response to the complaint. The complaint and response is then assigned to a Panel for review and determination. How long does it take to receive a UDRP decision? Often a decision is rendered within two months. The parties are given 10 days from the notification appeal the decision by filing a legal action in court. How much does a UDRP proceeding cost? Regarding cost, a UDRP proceeding costs less than an action in federal court and varies depending on if the Complainant seeks to present his dispute before a one person panel or a three person panel to decide the dispute. Counsel for EsquireTrademarks.com has represented parties on both sides of UDRP proceedings. We have represented clients located in the United States (Pennsylvania, California, New York), Europe, the Cayman Islands, Turkey, Lebanon, and Canada. Counsel has litigated against large multinationals. Esquire Trademarks has locations in Philadelphia, Allentown, and Scranton, and we practice nationwide. With a network of associate law firms and attorneys abroad, we project power internationally to secure and enforce intellectual property rights worldwide.